If you ever have the opportunity to listen in on the Green Party, you’ll notice a difference in their approach to politics and politicking immediately. The moderators, maybe it’s Craig Seeman or Starlene Rankin, have a conversational approach that makes you feel so included it takes a little while to get used to. Now maybe you are thinking, well, don’t I feel included already when I tune into one of National Public Radio’s innumerable talk shows? No, and you’ve never seen grassroots democracy at work till you listen to your next-door-neighbor telling you stories about knocking on doors, trying to get on the ballot, and their struggles contacting the press. In fact, you wonder what in the world would motivate these people to run for office and especially as a Green Party member. The more you visit the Green Party website, the more you realize there is a lot to learn because that is the essence of what a real working democracy means: you are required to become involved, not just sit back and allow media professionals to spin doctor your views all the way to the ballot box. The Green Party, the third largest political party in the US and the fastest growing party in California, provides a political alternative for those committed to building a sustainable and just society. According to the Green Party US, there are currently at least 100 Greens holding elected office. They include nonpartisan positions on school boards, college boards, transit districts, fire districts, water districts, community service, and neighborhood councils. Green Party candidates and officials make a difference even when their office is not subject to media scrutiny or we don’t necessarily vote for them in the ballot box, because the stronger the Party is, the more the public will take green issues and green voters seriously. Green Party voters are not socialists, but they want politicians to refocus on problems here at home rather than elsewhere. They care about access to voting for people of all socioeconomic backgrounds; they want more open debates; less money in politics; and support the four pillars (ecology, social justice, grassroots democracy and non-violence). Of course each candidate supports the Green platform to varying degree. Some people may support non-violence, but not total decentralization of government. Others may embrace more community based economics, but are unsure about ecological resilience. In the end, however, what distinguishes Greens is their commitment to a more participatory democracy and higher accountability. On Green Party Local Candidates Election Eve 2015, AGN learned a lot about the nuts and bolts of building your own Green Party platform for running for office from live interviews with Hillary Kane and Brandon Long. Seeman and Rankin interviewed candidates to watch for in 2015, including Kenneth Collins, New Jersey State Assembly 24th; Molly O’Brian State Representative 17th District, New Jersey General Assembly; Frank Cetera, City Council, Syracuse, NY; and Kristin Combs for City Council, Philadelphia, PA, and others. It was so inspiring to listen in because whether they were nominated by petition, such as Joann Cousin or Steven Welzer (on the ballot for NJ); or Frank Cetera for Common Council in Syracuse; you learned about what motivated these ordinary citizens. Whether it’s the need for system change or cultural change, their optimism is contagious. For instance, Frank Cetera explained his campaign tactics and his background as a state financial adviser with an established track record in community advocacy. He views running for office as an opportunity to speak out on local issues, anything from policy to quality of life issues. His name recognition stems from leadership in improving community parks and garbage services. Cetera also believes in the value of local community banks. Molly O’Brian, a younger Green, spoke about her learning experience of organizing a campaign and reaching out to college-aged students. Kristin Coombs shared how as a Green, she is bringing attention to concerns regarding Philadelphia’s schools, need to raise minimum wage, and civilian overview of policing. Once you realize that Green Party candidates are ordinary citizens like you and me, you start to notice them all around you. For instance, this summer at Soil Not Oil, AGN bought a sling-backpack from Pam Elizondo, past Green Party candidate for District 2 in North California. Imprinted on back are proposals to legalize marijuana, increase the tax base with a one-cent tax raise, and the advantages of growing hemp. 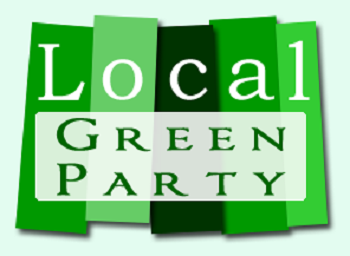 Credit: Image from LocalGreenParty.org, offering free webspace for local Greens.